This party inflatable has been rented all over Baldwin and Mobile County. It is a very fast slide and a refreshing water slide as riders end up in a pool of water. It also rents well at larger events due to its front loading stairs. Party guests can be seen ascending this large inflatable slide and they can also be seen on their way down this awesome slide. 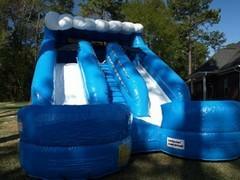 Reserve this party rental slide today.